This card is based on a rotary snowplow, a locomotive with snow-fighting equipment. It has a large set of circular blades that cut through the snow on the track ahead of it. The "You cannot Special Summon any monsters, except Machine-Type monsters." effect is a Continuous Effect. Even if you have multiple copies of this card in your hand, you can only activate the effect of 1 of those copies when an opponent’s monster declares a direct attack. Your opponent cannot activate "Torrential Tribute" when "Snow Plow Hustle Rustle" is Special Summoned from the hand by its own effect. After the "You can Special Summon this card from your hand" is performed, the "then" is performed afterwards. Furthermore, if the opponent chains "Mystical Space Typhoon" to the effect of "Snow Plow Hustle Rustle", so that you do not control any card in your Spell & Trap Card Zone, since the last thing to happen is the Special Summon of "Snow Plow Hustle Rustle", when "Snow Plow Hustle Rustle" is Special Summoned the opponent can activate "Torrential Tribute". 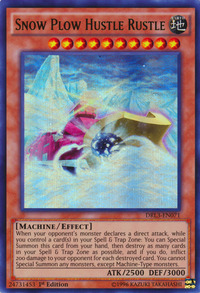 : Can the opponent activate "Torrential Tribute" when "Snow Plow Hustle Rustle" is Special Summoned from the hand by its own effect?